Daniel Lysons (The Environs of London, vol.1, 2nd edition, p.150) refers to Sir Henry, afterwards Lord Capel, of Teweksbury who became Lord Deputy of Ireland in 1696. He acquired Kew House by marriage and had a particular fondness for the garden, planting several new fruits brought from France. 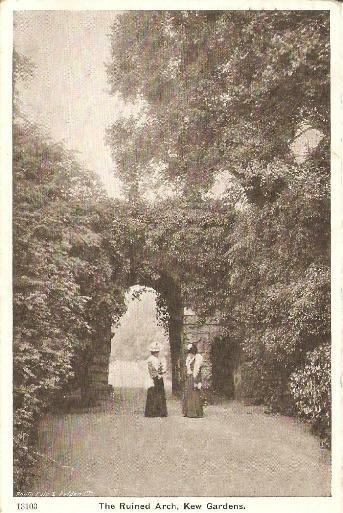 Lysons cites a book written by J. Gibson in 1691 that includes comments on Sir Henry Capel's garden. Gibson refers to two Jentiscus (or mastic) trees that cost £40 and four white striped hollies costing £5 each. Another book written in 1724 claims that the fine gardens produced the finest fruit in England. 'Notwithstanding the disadvantages of a flat surface, the grounds are laid out with much taste, and exhibit a considerable variety of scenery. 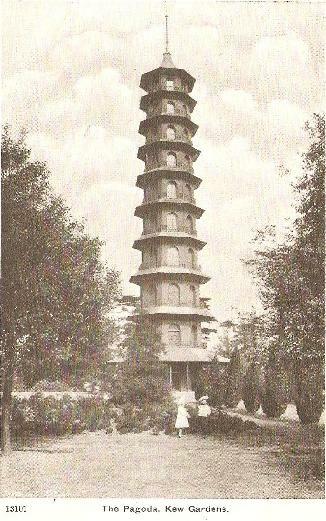 They are ornamented with various picturesque objects and temples, designed by Sir William Chambers, among which is one called the Pagoda, in imitation of a Chinese building: it is forty-nine feet in diameter at the base, and 163 feet in height, which renders it a very conspicuous object in the neighbourhood. The green-house is of very large dimensions, being 142 feet long, 25 feet high, and 30 feet broad. 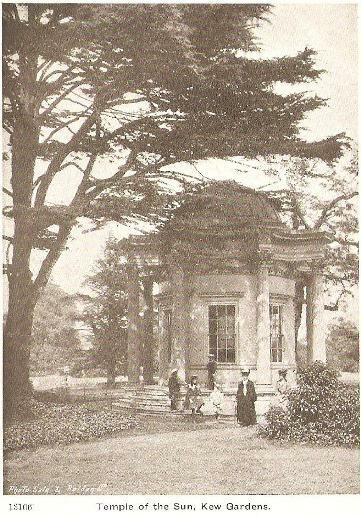 'The exotic, or as it is usually called, the botanic garden, was established in the year 1760, by the Princess Dowager. The present Royal Family being much attached to the study of Botany, His Majesty has bestowed great attention upon this garden, which exhibits the sinest collection of plants perhaps in Europe: persons selected for that purpose, by the late ingenious gardener Mr. William Aiton, were employed from time to time to collect new and rare plants from Africa, and other distant countries; this system is still continued, and the collection has been constantly increasing also by the communications of the President of the Royal Society, and such other zealous promoters of the science, as have frequent opportunities of procuring new feeds and plants from distant parts of the world. As a proof of the rapid increase of this collection, it was found necessary, in the year 1788, to build a new house, 110 feet in length, for the reception of African plants only; a house for New-Holland plants was erected in 1792; another with a span roof for New-Holland and Cape plants in 1803, besides some smaller houses for plants of various descriptions, on the ground purchased a few years ago by His Majesty of the Rev. Mr. Methold, and added to the botanic garden. Non est Deus ullus prseter Deum. The minarets are placed at each end of the principal building, and the architect's design in them, and in the whole exterior part of the building itself, seems to have been to collect the principal peculiarities of the Turkish architecture, which he has very happily effected.